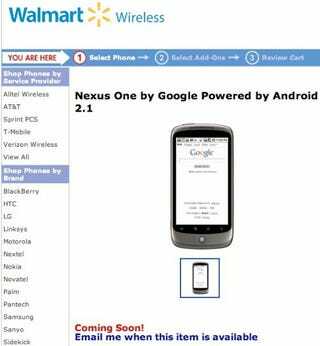 Google's Nexus One On Sale At Walmart Wireless "Soon"
Google wasn't exactly dancing for joy at the first week sales figures of the Nexus One, if the rumored 20,000 units is anything to go by. But that could change, with a Walmart advert saying it's "coming soon." Did The Nexus One Sell Just 20,000 Units In Its First Week? Currently only Google and T-Mobile sell the Nexus One in the States, although Verizon is supposedly going to stock it sometime in 2010.